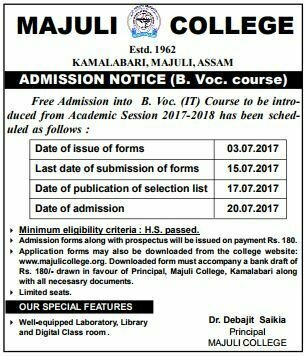 Established on September 17, 1962 with a sacred mission of illuminating the river-island with the beacon of education, Majuli College is the premier institution of higher education situated at Kamalabari in Majuli, the only island district of Assam. What necessitated the college to be founded at Kamalabari was the geographical isolation and educational backwardness of the most populous river-island of the world. Connecting it with the mainstream of the country was a challenge in the early sixties. A host of conscious educationists and public activists realized that it could be done only through the pursuit of higher learning. A public meeting was held at Majuli Milan Sangha, Kamalabari in the month of March, 1962 with the sole objective of having a discussion on founding a college to impart higher education to the Majulians. The meeting constituted a steering committee consisting of members from all communities to go ahead with the task. Late Keshabram Borah was made President and Late Krishna Kanta Goswami Secretary of the steering committee. 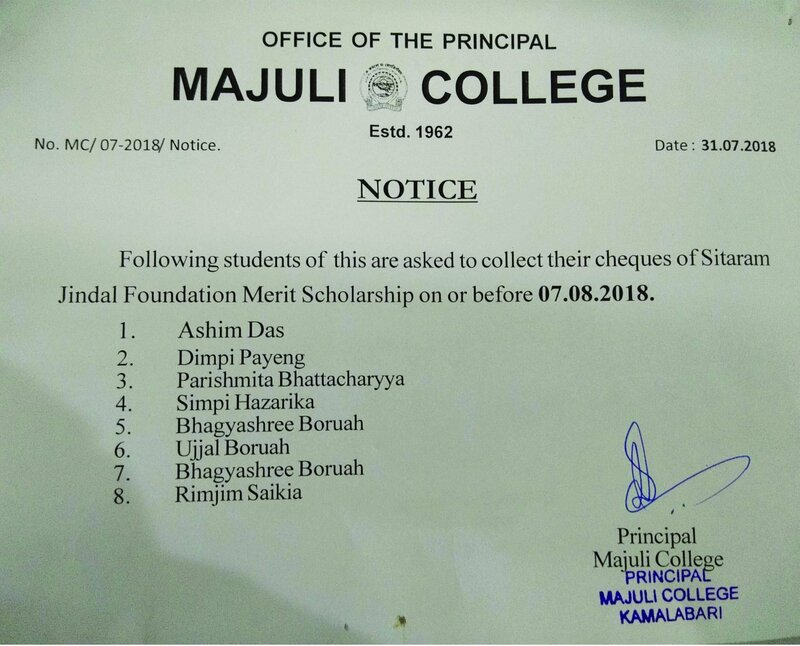 It was a time when devastating floods were posing tremendous threat to their historic endeavour, but, these two illustrious sons of Majuli along with a few devoted persons toured every nook and corner on foot and mobilized public opinion, collected donations for the proposed college. Thus, the dream of opening a college was fulfilled. 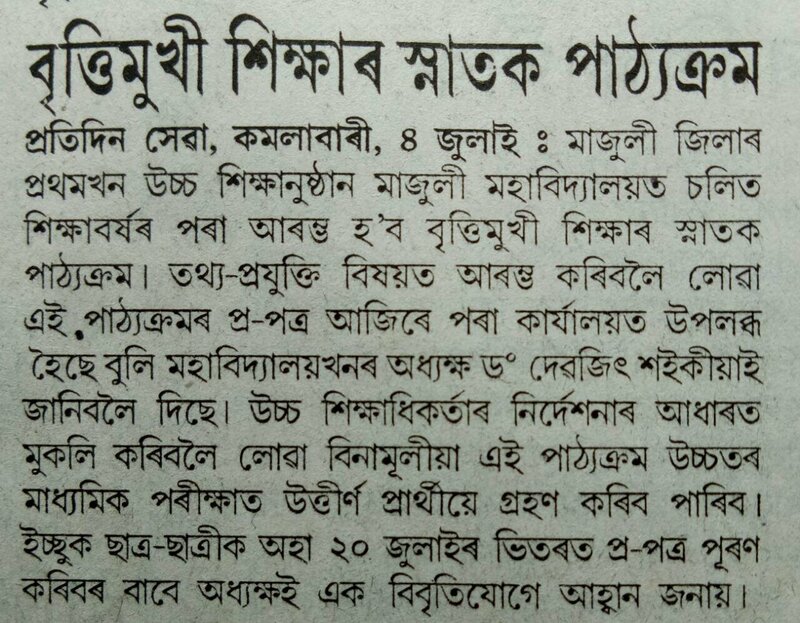 It is worth remembering that another ideal son of Majuli Atul Chandra Goswami, who was serving as a lecturer in History at North Lakhimpur College then, was kind enough to agree to serve the newly established college as its honorary Principal. He continued his service in this capacity till 1995. We always see to make students useful to the society with a tremendous regard for human values. We aim at making our students self-reliant by cultivating in them scientific outlook free from all sorts of prejudices and superstitions. The stupendous success of our Silver Jubilee Celebrations in 1988 and Golden Jubilee Celebrations in 2013 speaks of glorious tradition of this institution. 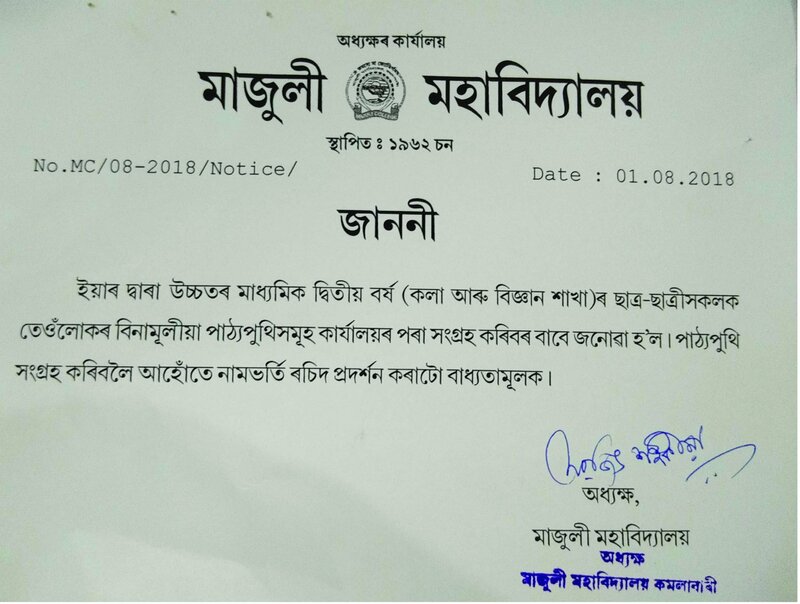 Products of Majuli College are serving in government offices, schools, colleges and universities and different private establishments with dedication, sincerity and innovative thinking inherited from this institution. 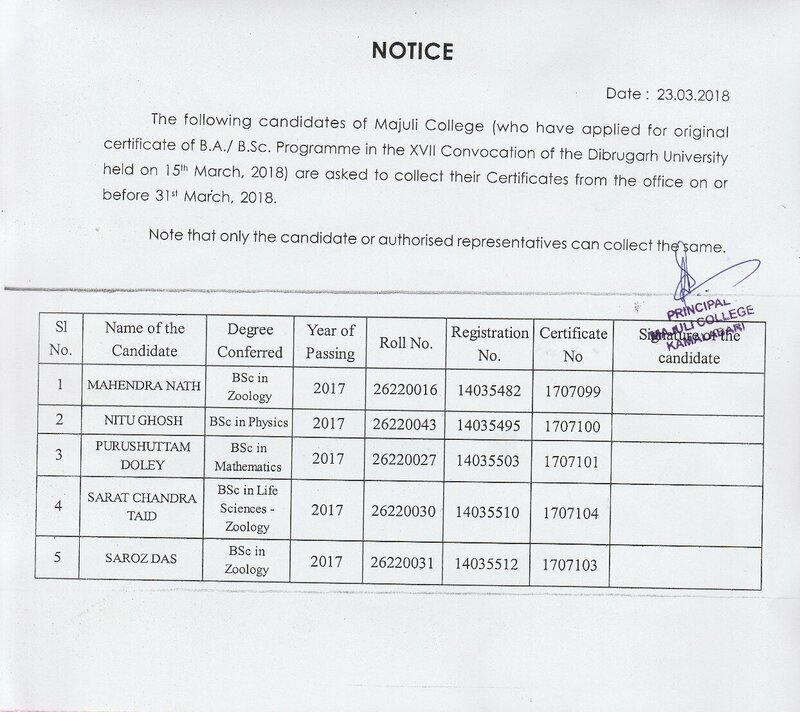 Affiliated to Dibrugarh University, Majuli College has been imparting education at the Under Graduate level in both Arts and Science streams. While the Arts stream has been functioning since inception, the Science stream was started in the year 1978 and it came under Deficit Grants in Aid system in 1986. Presently, the college has 10 (ten) departments in Arts stream and 5 (five) departments in Science stream. 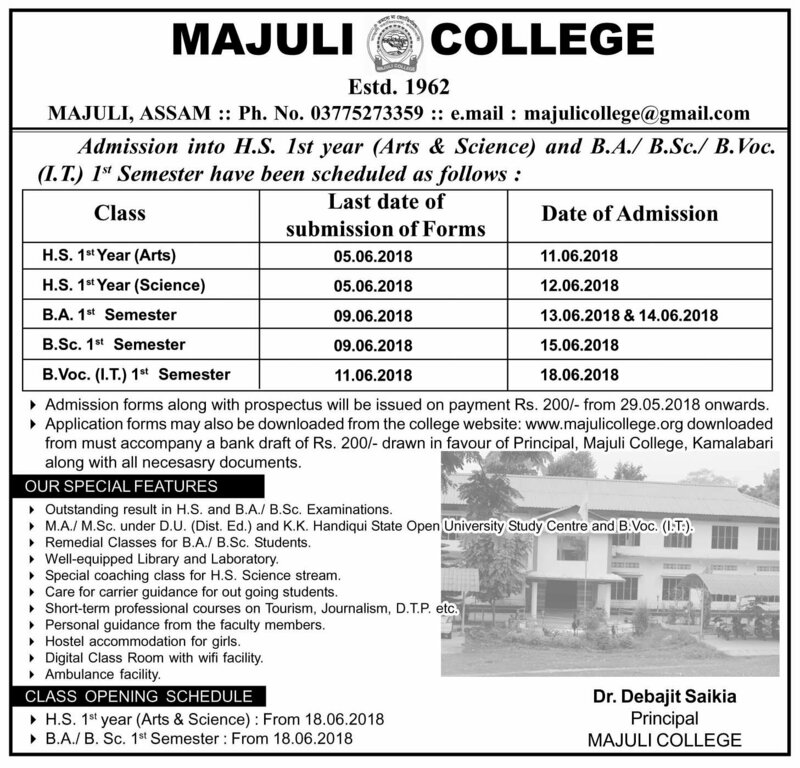 Offering both Higher Secondary and Degree courses to about 1000 students per year, Majuli College is the only college in the island which has both Arts and Science streams. The college offers P.G. 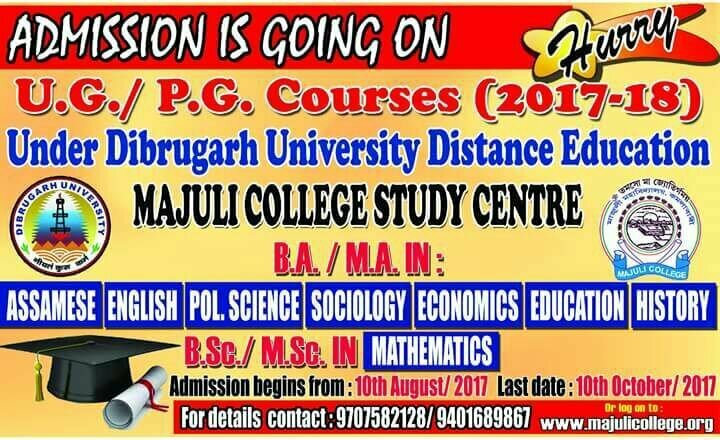 courses in Distance Learning Mode under Dibrugrah University and U.G. and P.G. 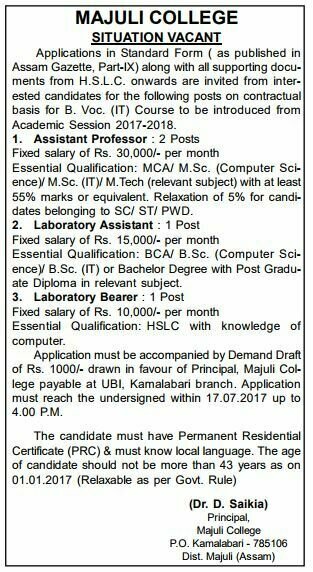 courses in various subjects under Krishna Kanta Handiqui State Open University. Other than these, the college offers vocational courses for the benefit of the students in Tourism, Journalism, Computer Applications and Social Works at its own discretion. With support and co-operation of a host of dynamic and forward-looking professionals the college vows to leave its indelible imprints on the sands of time.